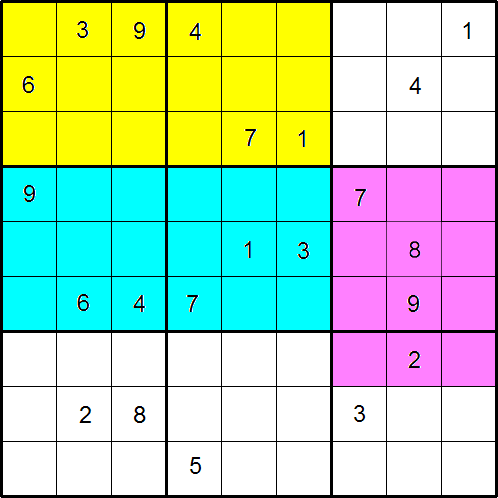 As in a standard Sudoku, the object of the puzzle is to fill in the whole 9x9 grid with numbers 1 through 9 so that each row, each column, and each of the nine 3x3 boxes must contain all the nine different numbers 1 through 9. EVERY group of nine cells that form a 3x3 square within each 'island' must contain the numbers 1 through 9. For example, take the cell r6c8 which contains the number 9 as the centre of a 3x3 square within the pink 'island'. The eight surrounding cells (r5c7, r5c8, r5c9, r6c7, r6c9, r7c7, r7c8 and r7c9) must contain all the remaining eight digits. Networks/Graph Theory. Mathematical reasoning & proof. Games. Logo. Visualising. Working systematically. Simultaneous equations. Combinatorics. Creating and manipulating expressions and formulae. Properties of numbers.